The underworld is an interesting and mysterious place, full of dark history which few have yet to experience and in fact may even fear. This could easily be mistaken for the opening of a mob movie or documentary on unlicensed underground boxing. However I am referring to the world of caves. Giant sinkhole in the forest leads to this cave near the Bay of Fundy. As we go about our daily lives on the surface we rarely take time to think about whats lurking beneath our busy feet. These dark chambers provide shelter and home for many species of fascinating and often misunderstood animals, most notably the “Bat”. Hollywood has taught us to fear these screeching creatures of the night. 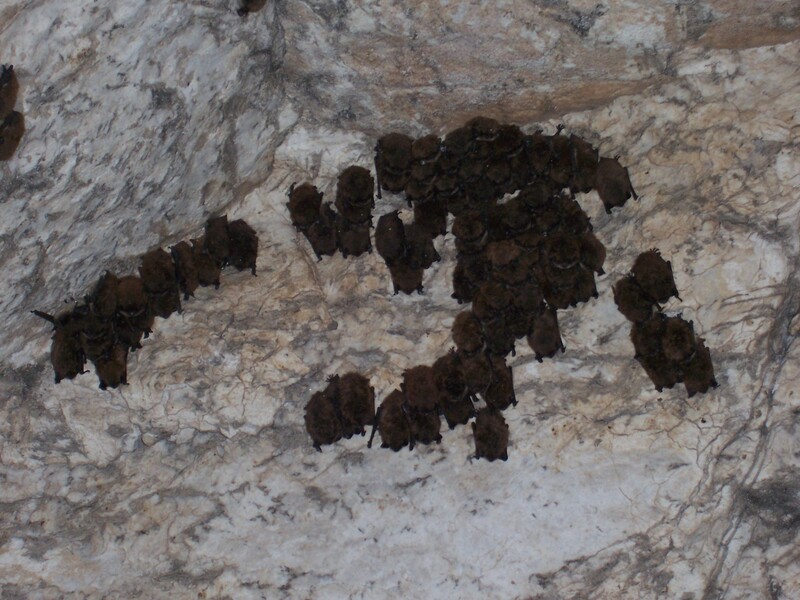 Don`t dare venture into a cave unless you are prepared to have your blood extracted through the back of your neck and have bats purposely attack your hair, I mean really – bats do like a good tangle. Catching up on some much needed beauty sleep. This could not be further from the truth. Bats have a very precise sense of where they are flying. Using echolocation they bunch a series of beeps and squeaks off objects and listen to various frequencies to guide them during flight. Trust me they know you are there and would rather not be the cause of you having a bad hair day. Besides these critters are only awake for a few hours a day and more often then not at night when flies and other insects are in higher volumes and more vulnerable as prey, being caught in mid air or “on the fly”. In the last decade or so cave exploration has become very popular and even draws tourists to certain countries. In North America we now refer to this sport as “spelunking”. Abandoned mine shafts, natural caverns and deep hallows are now a playground for adventure seekers in this day in age. Here in Nova Scotia with our diverse geography many of these caves can be found in the most peculiar places. Tucked away in the deep forest, along the rocky coastline and others just minutes from busy highways. 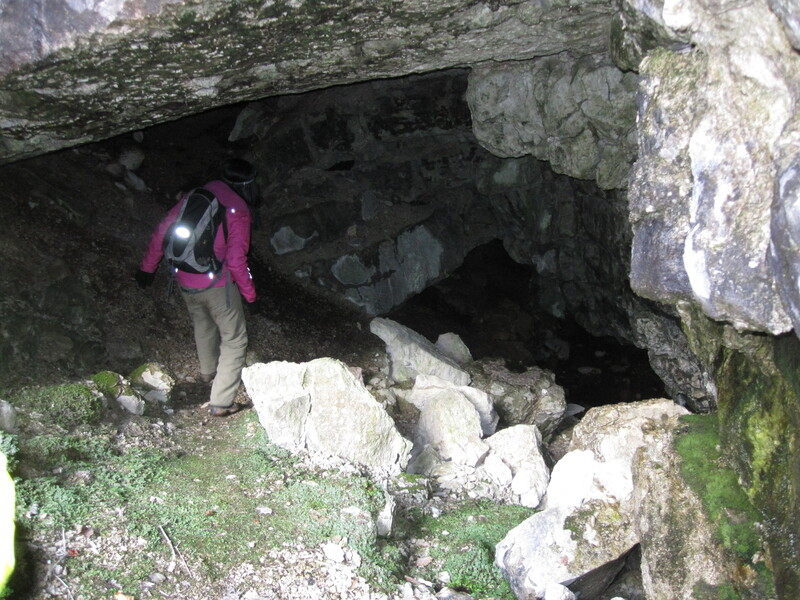 When entering many of these caves you will quickly notice the drop in temperature, the air becoming cool and damp. Miniature stalactites hang from the ceiling like colorful icicles and tiny brown bats snuggle together in cracks and crevasses, while others dangle by their little claws clinging to the rock above. Shining your headlamp around rock formations resembling creative sculptures surround you in all directions, from either side to high above. Many of these formations be sculpted by running water over hundreds and sometimes thousands of years. 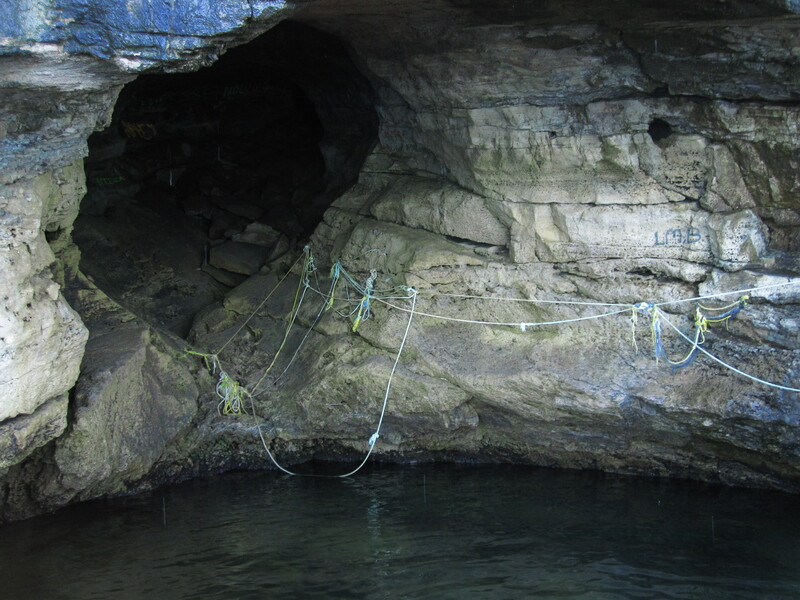 Guide ropes to help scale the exterior walls of this sea cave in Cape Breton. Wherever you find Gypsum cliffs in Nova Scotia your bound to discover a cave system of some sort. Some of these systems only appearing as a small sinkhole while others being the length of a football field or longer. I’ve always had a fascination with caves. Is it knowing that above me a forest grows tall and the roots from these trees help hold together the ceiling of these very caves. Is it that life as harsh as it may seem continues to evolve in these dark places, providing home for a few hardy species. Or could it be that we have probably only begun to scratch the surface or in this case, under the surface of these relatively unexplored masterpieces of nature. 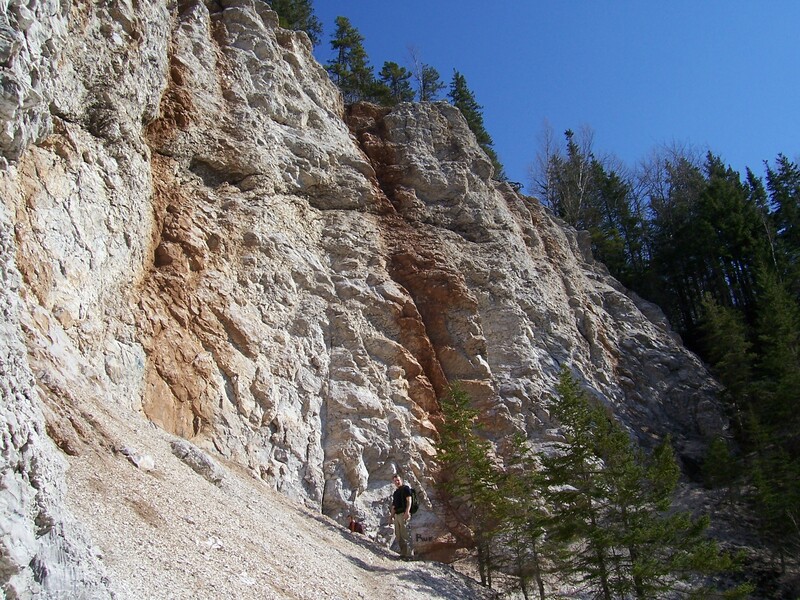 Towering gypsum cliffs above the main entrance to one of Nova Scotia’s largest cave systems. Whatever the draw may be, with the proper equipment and good navigational skills one can get to experience the underworld which we have been taught to fear for so many years. You’ll soon discover that facing your fears and stepping out of your element will fuel your desire to explore more often and in places you never thought you may end up – isn’t that what exploration is all about?